This article is about the fake Bowsers from Super Mario Bros.. For other uses, see Fake Bowser (disambiguation). Artwork of a fake Bowser in Super Mario 3D Land. A fake Bowser (also called Bowser Impostor or Bowser's decoy) is a standard enemy that was transformed by Bowser's black magic into a duplicate of himself. They first appear in Super Mario Bros. 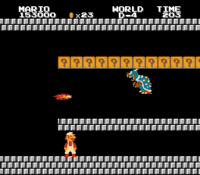 The reason for the fake Bowsers in the original Super Mario Bros. is due to the fact that, while the game was still in development, since all enemies have their sprites flipped upside-down when they are defeated (except for Piranha Plants, which simply disappear, and Bullet Bills, which stay rightside up, while defeated Koopa Troopas and Buzzy Beetles turn into upside-down shells), one of the programmers accidentally inserted an upside-down Koopa Troopa shell when portraying Bowser's death animation as if he were defeated with fireballs. The developers liked this idea, and as a result, this idea was kept. A fake Bowser in Super Mario All-Stars. Mario facing the fake Bowser's Brother in World D-4 of Super Mario Bros.: The Lost Levels. Like Bowser, the blue Bowser's Brother in World D-4 is also a fake revealed to be a Spiny when defeated with fireballs, and only breathes fire. In Super Mario All-Stars, both of these fakes are replaced with the real ones, although Bowser's Brother is now green and looks identical to his sibling. In Super Mario Advance 4: Super Mario Bros. 3, a fake Bowser appears as a boss in the World-e level Classic World 1-4, where it plays a similar role to that played in Super Mario Bros., though it looks identical to the game's real Bowser. It is revealed that the fake Bowser is a Goomba if it is defeated with fireballs. 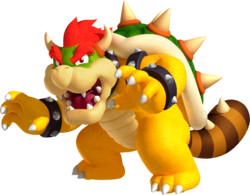 Screenshot of a Tail Bowser from Super Mario 3D Land. Fake Bowsers, referred to as Tail Bowsers, appear in Super Mario 3D Land. They have spiky raccoon tails, and they attack like they do in Super Mario Bros., breathing giant fireballs and jumping around the stage, though they do not throw hammers. However, unlike in Super Mario Bros., only two Tail Bowsers appear: one in World 1- Castle and the other in World 5- Castle. They are also immune to projectiles. In order to defeat a Tail Bowser, Mario or Luigi has to press a switch at the end of bridge to make it collapse and send the Tail Bowser into the lava. After falling into the lava, Tail Bowsers bounce upwards and show their true forms (a Goomba in World 1, and a Magikoopa in World 5) with a Super Leaf beside them. In Super Mario Run, fake Bowsers appear at the end of the fortress levels in Worlds 1, 3 and 5. They are a Goomba, a green Koopa Troopa, and a Buzzy Beetle, respectively. While a fake Bowser never appears physically in Mario & Luigi: Paper Jam, one appears on a Battle Card, taking its design from Super Mario 3D Land. A fake Bowser as it appears in Dream Figure Skating chasing the real Bowser, his son, Dr. Eggman, and Mario. A fake Bowser appears as a boss in Mario & Sonic at the Sochi 2014 Olympic Winter Games, specifically in the Mario World version of Dream Figure Skating. The appearances of the stage and its boss are based off Super Mario 3D Land. He chases the team across a giant collapsing bridge, spitting fireballs at them. The team must hit four buttons at the same time to cause the fake Bowser to fall into lava, where he turns into a Goomba and a Super Leaf. The fake Bowser from World 1-4. The fake Bowser of World 1's true form: a Goomba. A cardboard Bowser in Mario & Luigi: Superstar Saga. The World 3 and World C (original) fake Bowsers are the only Buzzy Beetles that can be defeated by fireballs (outside of the anime), and the World C (All-Stars) and "You VS. Boo" 2-4 (Deluxe) ones are the only Bullet Bills that can be defeated by fireballs. 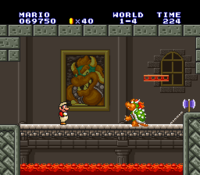 In Mario & Luigi: Superstar Saga and Mario & Luigi: Superstar Saga + Bowser's Minions, an exaggerated cardboard Bowser suspended by a pair of ropes over a bridge is seen at the end of a special area inside Bowser's Castle, which is a side-scrolling level imitating a Super Mario Bros. castle. Mario must move underneath the stationary object and touch the axe to make it fall. It is unknown if it is meant to be a caricature of a fake Bowser or the real one. Fake Bowser's Super Mario 3D Land artwork is in almost the exact same pose as Dry Bowser's artwork for Mario & Sonic at the Olympic Winter Games and Mario Kart Wii. ↑ von Esmarch, Nick. Super Mario 3D Land PRIMA Official Game Guide, pages 28 and 76. ↑ Shogakukan. 2015. Super Mario Bros. Hyakka: Nintendo Kōshiki Guidebook, Super Mario 3D Land section, page 180. This page was last edited on April 23, 2019, at 00:27.